or see a page on a music website without seeing teenage star Billie Eilish staring back at you. Her album, WHEN WE ALL FALL ASLEEP, WHERE DO WE GO?, has just arrived and, for the most part, met with passionate acclaim. The American artist released an E.P., don’t smile at me, in 2017 and, since then, I have seen her grow more ambitious and daring. Before I investigate her debut album and the song I selected from it, it is worth talking about young/newer artists and a certain voice; the new way Pop is going and those who are adding something fresh; putting pressure on young artists and allowing them to grow; following something as big as WHEN WE ALL FALL ASLEEP, WHERE DO WE GO? and, in the case of Eilish, growing out into the world and where she can head – I might also nod to her personality and why she adds a certain freshness. I must confess I am not completely on the Eilish bandwagon when it comes to fervency. I think there is a bit of a way to come regarding star quality and hitting her peak. There have been some brilliant reviews but, in some more mixed ones, there have been comments regarding an inconsistency – maybe her album lacks a balance and, in terms of sonic scope, there is not as much as there could be. 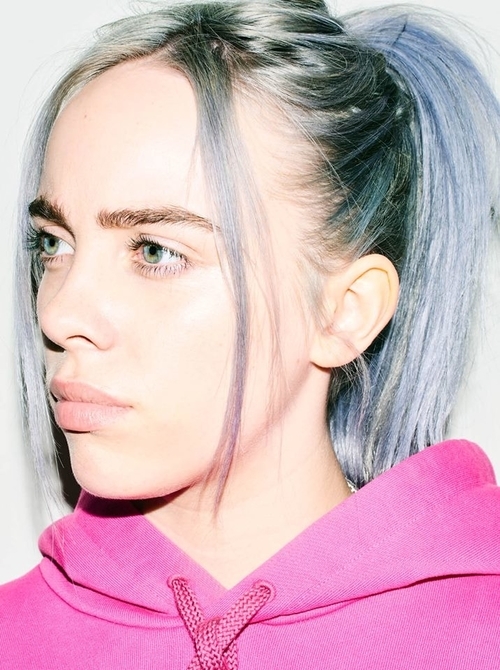 What is it about artists like Billie Eilish that stand aside? She might be the youngest of the approaching pack (still eighteen) but that is not to say she lacks experience and depth. In fact, in interviews recently, she has expressed her worries regarding her peers dying from drugs; how there is a lot of pressure on artists to succeed and what it takes to succeed. She definitely has a wise head on her shoulders and this bleeds into her music. A lot of the younger Pop artists, such as her and Sigrid, are straying from this rather simple template and creating music that has more personality and colour. “From her recent eerie single, Bury a Friend, to the brooding vision of grandeur in You Should See Me in a Crown, Eilish’s music conjures a twist on dark, theatrical pop, sharing as much DNA with the broad strokes of Broadway as it does Del Rey’s haunted balladry. The release of her debut album this week may mark the first time that many parents have heard Eilish, whose music represents everything about Gen-Z pop culture that foxes adults: genre-less but image-conscious; extremely online, but private. It deals in anxiety, sincerity and emotional intelligence, mixed up with classic teenage apathy. Her music, like her style, is difficult to place on a timeline or pin to specific references. It’s new and it’s accomplished. Eilish embodies it all. Lucid dreams, night terrors and sleep paralysis litter Eilish’s debut album, When We All Fall Asleep, Where Do We Go? It’s an album of firsts, of which Eilish has had plenty over the past year: being in love, experiencing the death of someone close and first time (she adds with another snort) being famous. She says it’s about the parallel awfulness of dreams and reality, and, occasionally, the pleasurable, dreamy quality of being alive. Her young life conveys no obvious torment or trial, but she makes a few lyrical references to her personal safety. She says she wouldn’t be able to do casual meet-and-greets any more for that reason. Although she feels happy on stage, she doesn’t feel physically safe up there. Before shows, “I’ll go through the back entrance because it’s the safest way for me to go. Sometimes, there are not-great people outside: not fans, sometimes people who … don’t want the best things for me.” Later on at the gig, I personally feel uncomfortable at the number of solitary older men incessantly taking photos of her”. I think a lot of people still have a set impression of Pop and what it is all about. They listen to BBC Radio 1 and hear something tinny and machine-fed and assume that this is what modern Pop is about. I agree that there is this mass that seems to be concerned with the same lyrical themes and sounds. You get a lot of boring and overly-processed songs that are all designed to be disposal and easy to understand. 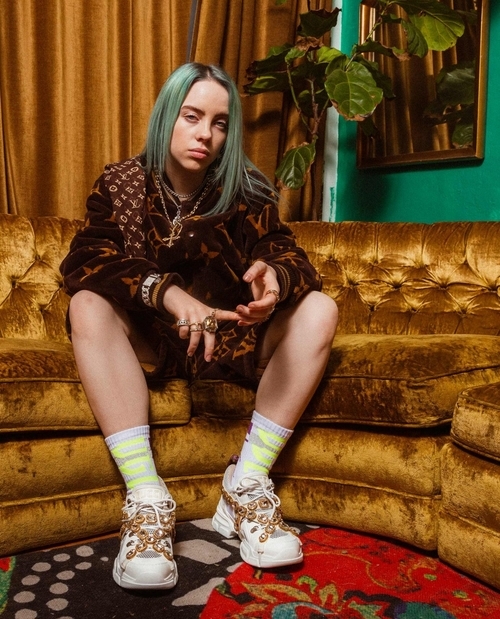 Artists like Billie Eilish are seeing the modern, popular sounds and offering alternatives. I do feel that the more interesting Pop artists – whether that is Billie Eilish or Sigrid – are doing something more personal and inventive. Eilish is getting a lot of warm nods because she throws in odd sounds and has this true personality. Whether you respond to her textures or feel they are a bit dark, one cannot dispute they are a stark contrast to what is deemed popular and accepted. There is a bravery and boldness in WHEN WE ALL FALL ASLEEP, WHERE DO WE GO? that staggers the mind. “The world is ending and I honestly don’t understand the law that says you have to be older to vote, because they’re going to die soon and we’ll have to deal with it. That doesn’t make any sense to me,” she says. “But to see young people taking part in peaceful protests and not obeying is beautiful”. I do wonder whether, when we see and promote these bold artists, there is too much pressure on their shoulders. I wrote a piece about Sky Ferreira recently: she has returned with an album and this ends a six-year period of relative inactivity. Some wonder what has taken her too long and, after a successful debut, why has she taken until now to come up with something?! Listen to her new song, Downhill Lullaby, and it is similar to what Eilish is putting out. Ferreira is producing something with a darker hue and more dramatic tone; another Pop artist that is writing in a more expressive and interesting manner. There has been pressure put on her shoulders and I feel there is this tendency to expect too much from young artists. Maybe it is the generational gap and the mid-1990s/mid-2000s that means young artists now are being inspired by different artists. Maybe they are not growing up around the same sounds or perhaps the way they promote their music is different. More are doing it bedroom-made and promoting on YouTube; many are growing up in a different world to the one in which their older peers have. It is interesting seeing the difference but I do worry that, still, when we see a young artist doing well there is this need for them to follow their latest album up right away. The business is so competitive and busy that there is a danger taking too much time away. If you have a big album like WHEN WE ALL FALL ASLEEP, WHERE DO WE GO? then, of course, many will want something next year and they will want Eilish to tour the world. There is a raft of press out there and so many column-inches so that does make me wonder whether Eilish will be allowed some time off. She will be touring her album and bringing it around the world but, at the age of eighteen, she has plenty of energy in her. The downside is that there will be this fatigue that kicks in and she will not be allowed to relax. I do worry that we are expecting too much from young artists and, in years to come, what affect that will have on their physical and mental-health. Eilish is just starting out but, given the fact she is gaining headway, does this mean she will be allowed any time for reflection and room before the end of this year? Eilish has spoken about her peers dying from drug abuse and suicide and she knows there is something worrying happening. Do we expect too much and drive artists to unreasonable lengths?! It is a hectic industry but, even if you do have this very rare talent in your midst, that does not mean they should be driven and pushed to the point of exhaustion. This is not a new thing in Pop. Look back at the 2000s heyday when the likes of Britney Spears ruled and, back then, there was this need for her to tour relentlessly and she rarely caught a break. I do hope that people lay off her and give Eilish the room to live her life and not be controlled. She is someone who will not be controlled but, in order to succeed and be heard, she does need to conform to an extent. I do feel like she will be able to balance work-life and not burn-out too much. WHEN WE ALL FALL ASLEEP, WHERE DO WE GO? is Eilish adding her own style and voice to music. I have also written a piece about how annoying it is to see the way songs and artists are stylised these days. I used Eilish as a focal point because, as you can tell from her album and song titles, she is someone who is not exactly beholden to correct English. She likes to put songs in lower-case-only letters and upper-case in the case of the album. This is something that bugs me but, when I posted my article on Twitter, someone came back and argued that this – and other artists that do this – is a case of adding personality and art into music. To me, it encourages bad English and other artists to be rather lazy regarding songs. I see so many songs without a question mark when they should; many with lower-case lettering where there shouldn’t be one – this also bleeds into lyrics which, in some corners, can be rather basic, unimaginative and simplistic. Even if the stylizing lettering is annoying and not really needed, maybe it indicates a style and sense of personality that is different from the rather straight and disciplined music around. Eilish is someone who can address the same themes as many of her more commercial artists – including depression and struggles in life – and add more ambition and flair. Listen to any song on WHEN WE ALL FALL ASLEEP, WHERE DO WE GO? and there is greater emphasis on the vocal nuance and experimental, interesting nature of the music than there is anything else. On so many Pop records, there is this need to be polished and formulaic. Many are too concerned with being radio-friendly and chart-conforming and you rarely get these more explosive and rare moments. Many have been calling for Pop to go in a new direction and take bigger risks. Billie Eilish is not the first artist to hone the sound she has right now – listen to FKA twigs and M.I.A. – but she could so easily have produced something pretty safe and soft. all the good girls go to hell is one of the more interesting and snaking songs on the record. It starts with a slow build and we get this sort of funeral wind and echo that suggests something dark. Eilish comes to the microphone with the words “My Lucifer is lonely” and you feel like we are going to have this punishing song. Just then, the track switches and we get a very bouncy and sweeter piano refrain and vocal that catches you by surprises. There is an element to the girl groups of the past like TLC and Destiny’s Child. Although Eilish’s voice is softer and less anthemic than those groups, there is a musical strut that makes the song pop. The lyrics, I wonder, might be about the heroine or a peer. She talks about standing there and killing time; not being able to commit to anything but a crime. Maybe this is a view of someone who is a no-good; a bad girl who is walking down a bad path and is wasting time with crime. Perhaps this is a side to Eilish and where she is in life. Many have noted how, on WHEN WE ALL FALL ASLEEP, WHERE DO WE GO?, there are oblique lyrics and not a set construct. Look at other Pop songs and you get these rather obvious lyrics. Eilish talks about someone called Peter being on vacation and drops in animals and evidence; “Pearly gates look more like a picket fence” – she has friends but can’t invite them in. Rather than being these simple and hand-feeding lyrics that set out their stall clearly, you do wonder with Eilish and what inspired this song. Maybe it is about recklessness and excess; living on the edge and being in this excessive frame of mind. I can see there are nods to contemporaries and her friends but I get the feeling Eilish is looking at herself and how she is walking down a darker road. The beat rolls and there is this funkiness and, all the while, Eilish keeps her voice somewhat whispered and calmer – reminding me of M.I.A. in some places. Eilish talks about hills burning in California and I wonder whether it is a look at something like climate change or more to do with celebrity culture or a changing landscape. Things are never obvious with Eilish and you do wonder where the true origins lie. That pre-chorus builds speculation and drama but, when the chorus comes in, Eilish talks of the good girls going to Hell; God (as a woman) having enemies and Heaven being out of sight. Maybe you can see those lyrics as a warning or something oblique but maybe there are words about gender-equality and balance; perhaps it is more about control and something darker in music. I feel like a lot of Eilish’s observations stem from her peers and where she lives. The Los Angeles-based artist is growing up around a lot of fakes and there is corruption around. I love songs that go deep and make you ponder. Everyone will have their own interpretations but, in my view, we are listening to a song that talks about the city and how it leads people astray. The song has this wired and buzzing electronics that mixes with a big beat and a skipping piano. It is like a fusion of classic House with some Electronic and Pop all mixed alongside one another. Eilish rides the wave but keeps some caution in her voice. She name-checks those who need her help and, once again, there is mystery. She speaks about a man/men being fools and not being able to save themselves. They are poisoning themselves and begging for help and I wonder whether this is a reaction drugs and excess or something else. I love the combination of the more anxious lyrics and intriguing scenes with the lighter and more spirited composition. Eilish discusses Heaven and Hell and her own private Lucifer; the dangers and darkness lingering and people in her life fading away. all the good girls go to hell is just under three minutes and you sort of end the track and want a bit more – addicted and held by the blends and layers the song provides. Everyone, as I say, will have their own view regarding the song’s truth and I find the lyrics are amazingly mature and deep from someone so young. Regardless of your views about Eilish, you cannot deny she is doing something new and her music definitely engages the senses! And although the jazziness is more latent than blatant in this sonic blast, she hasn’t done any disgrace to the name her parents gave her, either. Attention, 2020 Grammys: The future still isn’t quite done being female”. A lot more from her.